Adaev, or Aedaevskaya, horses are native to the Caspian Depression of Kazakhstan and originally consisted of two sub-types of Kazakh horses, Adaev and Dzhab, or Jabe, horses. However, because Adaev horses were used extensively to improve the Jabe stock, the Adaev breed was nearly decimated. Due to an increased interest in preserving bloodlines of the breed, 27,000 Adaev horses were gathered by breeders in 1985 to restore their number. The breeders then worked toward refining the breed by mixing Kazakh blood with that of Don, Thoroughbred, Alkal-Teke, and Orlov Trotters. As a result, Adaevs are a much better riding horse today; however, they are not as well suited for the harsh environments as the Kazakh. They stand from 13 to 14.1 hands or 52 to 56 inches high. Their height at the withers is 136 to140 cm or 53 to 55 inches. They come in chestnut, grey, bay, cream or palomino, chestnut, dun, and bay and grey. Adaev horses have a well-defined form and bone structure. They have a deep trunk and and their joints and tendons are clearly defined. Their head is large and lean and well-proportioned with a long, straight back and neck. Their ears are of various lengths and they have wide nostrils. They have unusually thin skin; their veins are visible on the surface. Their coat is well developed in the winter with a long mane and tail and some feather on its legs. Adeav horses tend to have more problems with hooves and legs than a Kazakh. Sometimes they have a narrow chest and too light bone which can sometimes occur due to the primitive management conditions. There are three types of the Adaev breed; Massive, Medium, and Light. The Massive type is a much more aggressively type. They are well balanced with a massive body and skeleton. The Massive type is known for their endurance and agility. The Medium and Light Adaev horses are used as saddle horses. They are high energy hardy horses having perseverance and readiness. 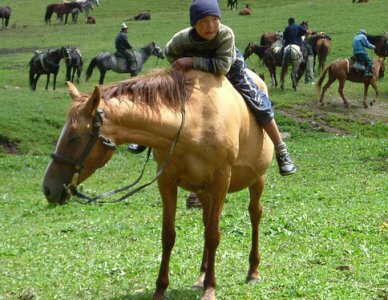 Adaev horses are often used for riding and labor on small farms. Mares have long been used for their high yield in milk production. They can produce 11 to 14 liters of milk per day. The milk is usually fermented into a drink called Koumiss, which is very healthful and used to cure many ailments. Adaevs are also raised for their meat.